We will admit that we've been a little fixated on Northside Piers, as it is the first highrise to go up on the North Brooklyn waterfront north of the Williamsburg Bridge and south of Newtown Creek. We're also drawn to it because we think it's superbly ugly, making the buildings that have gone up in Long Island City, for instance, look like high art. In about ten years of course, so many buildings will have been constructed--barring a real estate crash--that Northside will hardly draw a second look, except that by then, it will probably start showing its age. For now, it's the first. This is a view from this week across the open expanse of what will be yet another development site. 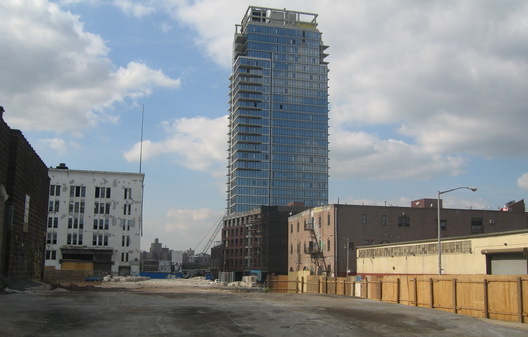 is there any new construction in wburg that you don't hate? wow that was actuly very funny, i live very close and i have been watching it getting built. The prices now are high but if they keep building more then the price sould lower, i would love to live there!